We established Focus Forward Wellness & Physical Therapy in 2008 in order to serve the community of Calistoga, CA with the highest quality, personalized physical therapy available. Focus Forward Wellness & Physical Therapy is your premiere destination for physical therapy in Napa County, CA. We bring a diverse breadth of experience and knowledge to serve the wellness and vitality of the community of Calistoga, as well as the greater Napa Valley, Sonoma and Lake Counties. We are licensed physical therapists specializing in Integrative Manual Therapy (IMT) and offer a whole-person approach to wellness, in that we treat the whole body and not just the symptom. When you do business with us we will make sure you receive a life-changing experience—an experience that seeks to put you in touch with your whole self. Our physical therapy clinic in Napa County, CA is dedicated to getting you back on your feet and moving around like never before. Our services include sports injuries, post-surgical rehabilitation, aging issues, women’s and men’s health, cancer symptoms and more. Additionally, we stock foam rollers, health supplements, gym balls, and various physical therapy products for home use. We are here to help all ages, from babies to seniors! Our staff even offers in-home services for the home bound. We provide general physical therapy and rehabilitative services. We have staff with over 23 years of experience. 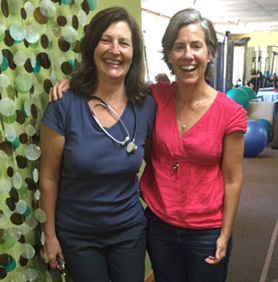 Our staff specializes in Integrative Manual Therapy and Women’s Health Issues. Our physical therapy practices are personalized for each individual client. Let us change the way you think about physical therapy. Contact us today for more information or to book an appointment.